Since April 14, 2015, the oustees of Kanhar Dam Project in the Sonbhadra distrct of the northern Indian State of Uttar Pradesh are facing police brutality, harasssment and arrests for carrying on a peaceful, non violent democratic protests. Many women were injured in two consecutive police firing on April 14 and 18, 2015. Many women have been arrested and are languising in jail. On June 30, two prominent leaders of the movement, Roma and Sokalo were arrested from the office of the All India Union of Forest and Working People in Robertsgunj. They have been denied bail and remanded in judicial custody. We request you to send letters of protest to the Chief Minister and/or Chief Secretary of Uttar Pradesh.against this barbaric police firing, violence and arrest of women and activists. You can send protest letters directly to the Chief Minister and/or Chief Secretary or endorse the protest letter, a draft of which is attached here with this email. Please feel free to modify the letter if you wish. Endorsements can be sent to the Secretariat of the All India Forum of Forest Movements (AIFFM) at aiffmsecretariat@gmail.com. We are deeply concerned at the reported incidents of police firing, violence and arbitrary arrests of tribals and activists including women protesting against the illegal land acquisition and forest clearance for the Kanhar Dam Project in Sonbhadra district of the northern Indian State of Uttar Pradesh. 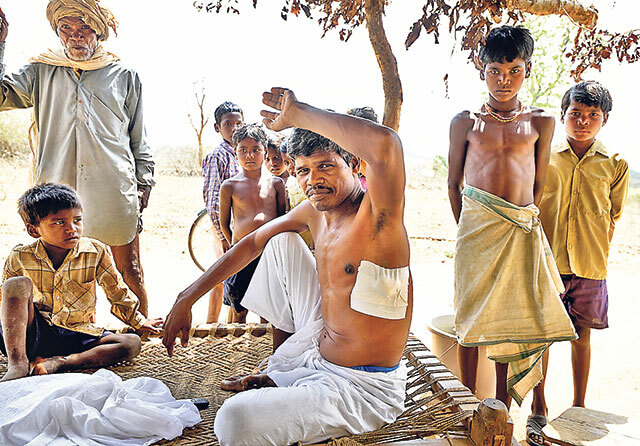 Reports indicate that on April 14, 2015, the Uttar Pradesh police fired on oustees of the Kanhar Dam Project who were on a democratic, non violent and peaceful protest. The protestors included large numbers of women and children. Many women were reportedly injured and many more were taken into custody. This police brutality and violence against peaceful adivasis (tribals) and dalits (backward caste communities) was repeated again on April 18, 2015 when police fired again grievously injuring several protestors and some key activists were arrested who are languishing in jail since then. We understand that the National Green Tribunal (NGT), the Environment Appellate Court in India, in its judgment of May 7, 2015 has clearly indicated that the construction of the Kanhar dam is illegal and the project has no appropriate and statutory clearances including the Forest Clearance and that the claims of the Uttar Pradesh government are incorrect. The district administration’s contention that an insignificant percentage of adivasi population would be affected by this dam has also been proven to be wrong by the court which has categorically stated that the project will cause displacement to a large population, the majority of whom are tribal and is likely to evict nearly 7,500 families from 25 villages and that it would be necessary to arrange for their rehabilitation. The NGT has in this judgment expressed serious concern on environmental issues and has pointed out that Kanhar river is a major tributary of Son river which is a major tributary of Ganga and due to construction of several dams and water diversion structures on Son including Rihand Dam and Bansagar dam, the river Son is facing great threats in terms of its riverine characteristics – loss of fish species and invasion of exotic fishes in the river, with adverse affects on the river flow, velocity, depth, substratum, pools, ecology and fish habitats of the area. We have also come to know that the mandatory consent of the Gram Sabhas of the affected villages have not been taken thus violating the Forest Rights Act, 2006 passed by the Indian Parliament. To make matters worse, the Uttar Pradesh police raided the office of All India Union of Forest Working People (AIUPFW) in Robertsganj, Sonbhadra, on 30 June morning, and after grossly abusing and insulting the activists present in the office, arrested Roma and Sokalo, the two prominent women leaders of the anti Kanhar Dam Movement. Since then, they have been denied bail and remanded in judicial custody. We, therefore, strongly protest against the police firing on peaceful protestors, harassment of adivasi, dalits and activists, wrongful arrests, false and fabricated cases slapped against them and police brutality. The right to peaceful protest is part of the fundamental right guaranteed by the Constitution of India and no government can take away or infringe upon this sacred right. – Unconditional and immediate release of all villagers and activists, including Roma and Sukolo, arrested in connection with the protest agitation against the Kanhar Dam Project. – Immediate punitive action against the police personnel involved in the firing incidents and the 30 June raid on AIUFWP office at Robertsganj. – That the Uttar Pradesh government and its district administration at Sonbhadra, initiate a dialogue with the affected people of the Kanhar Dam project and obtain appropriate and statutory clearances according to the laws of the land. We express our solidarity to the people of Kanhar who are facing the brunt for standing up for people’s rights, and against wrongful decisions and illegalities in the name of development.